J. Meverington is currently house sitting around the world and writing novels. 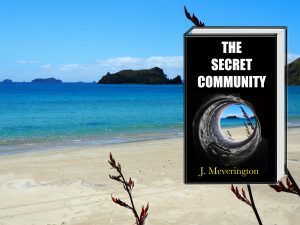 Her debut novel, ‘The Secret Community’, is out now on Amazon. The Community lies in an idyllic location on the coast, surrounded by mountains. A small group of people live there in harmony with each other and the land. The outside world knows nothing about them and it must remain that way for their lifestyle to continue. But is their lifestyle really that ideal? They work hard seven days a week to survive and live under the constant threat of ‘The Punishment’. There is also a dark secret that lingers over them, isolating them from a world they could never imagine. Will they ever be discovered and will the secret, that is keeping them isolated, be revealed?